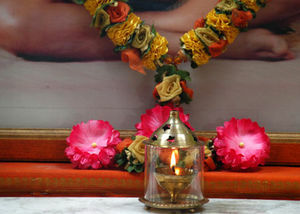 yoga asana classes, meditation, yoga nidra - relaxation, chanting & havan, yogic discussion, personal time for walking, bike riding, study and connecting with the ashram community. All the branches of yoga are woven into the daily life of the ashram to harmonize, balance and restore clarity and direction for the purpose of self transformation on all levels of the entire personality. All classes are expected to be attended as part of the ashram lifestyle to maintain harmony, health on all levels of the personality and to gain skills for living an ongoing life inspired by a yogic culture. 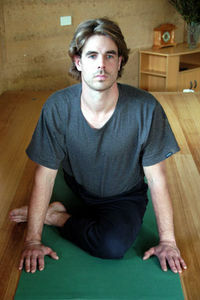 Hatha Yoga: is primarily concerned with bodily purification practices through awareness during asana – postures, pranayama – breathing techniques, yoga nidra – daily relaxation. Karma Yoga: the practice of yoga awareness in action is a shared activity in the many and varied projects within the Ashram. Karma Yoga gives the opportunity to develop the yoga of equanimity – a balanced state of mind by observing the different levels and thought patterns of the mind and emotions as they arise. By engaging in the different activities of the ashram’s daily life one not only shares skills, but gains skills from other ashram residents and visitors. Mantra: chanting is to redirect the mind away from its limitations towards a positive state of personal evolution and balance. Bhakti Yoga: is becoming aware of our sentiments and emotions and how to raise them beyond the limitation of the mind and lower emotions. Jnana Yoga: is known as the yoga of knowledge and wisdom gained in meditation and mindfulness in the activities in our personal and worldly life. Jnana yoga develops clarity, truth, direction and the intuitive nature.